Trump picks Supreme Court justice between finalists Gorsuch and Hardiman. Judge Neil M. Gorsuch is Trump’s Supreme Court nominee. 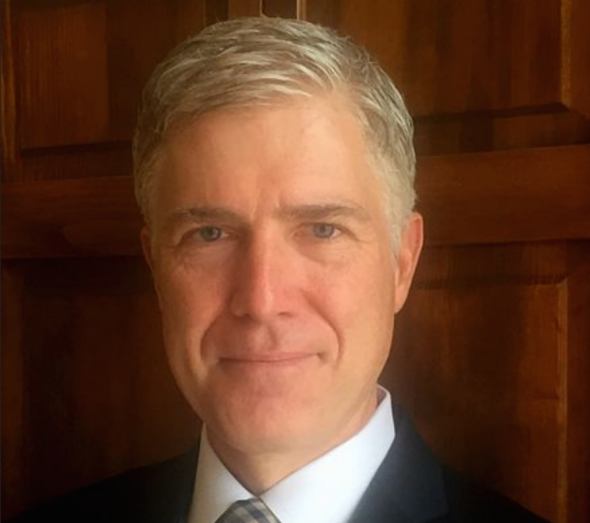 On Tuesday, after a buildup that reached absurd reality TV show–like heights, Donald Trump nominated federal appeals judge Neil M. Gorsuch of the 10th U.S. Circuit Court of Appeals in Denver to fill the Supreme Court seat made vacant by Justice Antonin Scalia’s sudden death nearly a year ago. Republicans in the Senate stonewalled the then–sitting president of the United States’ Supreme Court nominee Merrick Garland for an unprecedented 10-and-a-half months, leaving the court shorthanded for 352 days and paving the way for reality TV star Donald Trump to make the selection. Gorsuch’s nomination comes at a point of nearly unprecedented constitutional crisis in the U.S. as President Trump has called into question the norms, values, and laws of not only the office of the president but the entire executive branch, not to mention the country as a whole. Trump has a unique opportunity not only to sway the ideological makeup of the bench in the opening days of his presidency; he also has the chance to appoint potentially the deciding vote on whether his executive orders will be considered legal. Judge Gorsuch’s credentials are the most traditional of the finalists: degrees from Columbia, Harvard Law School and Oxford, as well as a clerkship on the Supreme Court … Mr. Bush appointed Judge Gorsuch, 49, to the 10th Circuit in 2006. There, he has earned a reputation as an originalist, trying to interpret the Constitution in accord with the understanding of those who drafted and adopted it. That approach generally leads to conservative decisions, but Judge Gorsuch has written little on several issues of interest to the right, including gay rights and gun control. He does, however, have a strong record of favoring religious freedom over other values, built largely on two prominent cases in which he sided with employers who objected for religious reasons to providing some forms of contraception coverage. Both cases, which involved Hobby Lobby Stores and the Little Sisters of the Poor, were eventually considered by the Supreme Court. Trump had signaled he intended to make his pick this week, originally suggesting it would happen on Thursday evening, before chosing to announce the appointment to the highest court in the land on Tuesday night in prime time. The buildup to the entire affair had the air of a game show, as the two presumed finalsts Judge Gorsuch and Judge Thomas M. Hardiman were both summoned to Washington, D.C., on Tuesday as the “finalists” for the position. Trump had said explicitly that he had already chosen his guy, meaning having both come to the capital was an attempt at showmanship, to juice ratings presumably, or perhaps to divert attention from the the legal wrecking ball the Trump administration has taken to the United States government over the past week. Gorsuch’s confirmation process is sure to be bruising and could last as long as two or three months, according to NPR. Meanwhile, Senate Democrats were gearing up to filibuster Trump’s nominee even before the selection was made. That would mean the Trump pick would need to clear 60 votes in the Senate and would surely lead to a historic showdown in Congress. Read more in Slate about Neil Gorsuch.